Epithet is after Dr. John Scouler who accompanied David Douglas, of Douglas fir fame, on his journey to the Pacific Northwest in 1825. Evergreen, 6 to 20 in. (15 to 50 cm).Zones 8 and 9. Apogamous. description: The rhizome is wide-creeping and apparently without flavor. 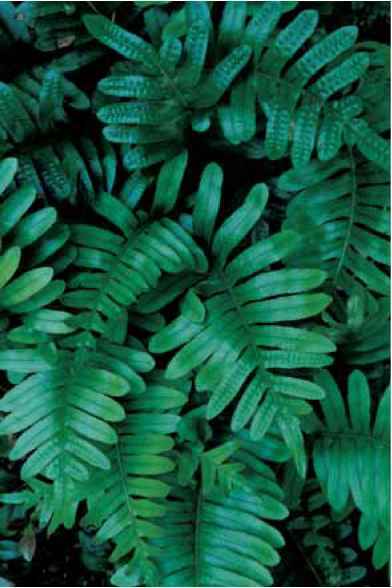 The pea-green, grooved stipes, of up to one-half of the frond length, are, like the entire frond, thick and succulent. Glistening, deep forest-green, pinnatifid blades are ovate with 4 to 12 pairs of chubby lobed pinnae. One-eighth-inch (3-mm) large, indusia-free sori house showy spores that are a warm harvest moon yellow when ripe. Polypodium scouleri hybridizes with P. glycyrrhiza. range and habitat: This species is confined to the coastal regions, usually within a few hundred yards of the salty Pacific, from British Columbia, Washington, Oregon, and ocean fringes to Baja California with the greatest concentration in the Pacific Northwest. 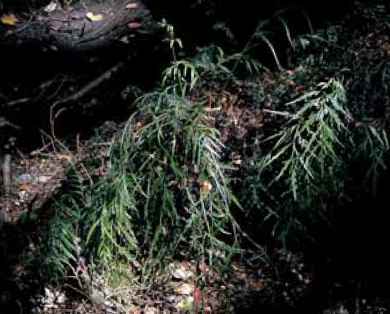 Here they settle in dark woods in the crotches of the native spruce, Picea sitchensis, dead or alive, and can easily be overlooked in nature as perhaps a casually constructed spacious eagle's nest. Visitors to the Washington coast can find excellent photo ops at the state beaches especially those that are imaginatively named Beach 1 and Beach 4. The glossy fronds of Polypodium scouleri are a welcome component in the dark and shade of moist woodland gardens. equally decorative. In spite of its leathery texture, this fern wilts in summer sun unexpectedly faster than many of its more delicate fellow natives.